Only two weeks until the RAGS Hamfest, Sunday July 10th! 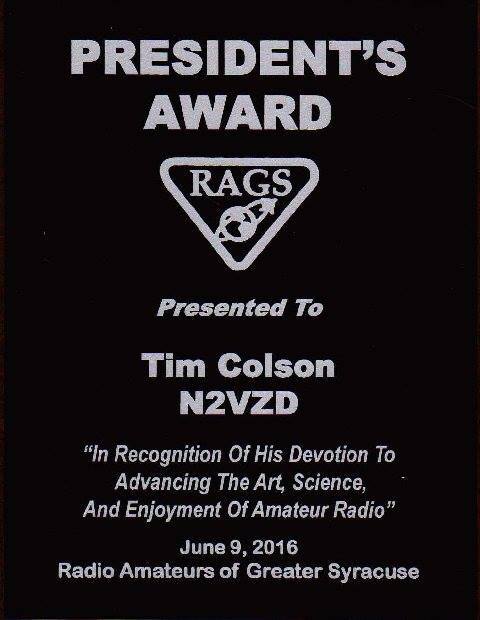 RAGS President's Award to N2VZD! Congratulations to Tim Colson; N2VZD! 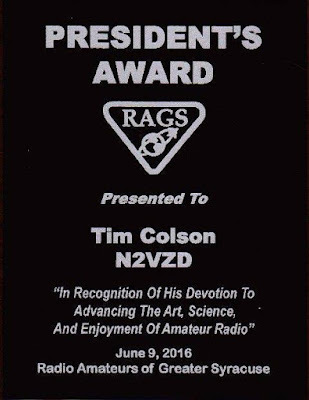 Tim was recently presented the 2016 President's Award by the Radio Amateurs of Greater Syracuse (RAGS). Tim is one of those guys who gives a lot back to our great hobby! He is always willing to lend his knowledge and experience to Hams new or old. He has been a promoter and constant advocate for getting weekly NET's going almost every night of the week here in CNY. If he isn't running one, he is usually one of the most consistent check-ins! You can find Tim morning, noon or night on the 146.67 repeater in Syracuse. Thanks Tim for all you do for Amateur Radio in Upstate NY! The Fulton Amateur Radio Club is participating in the International Lighthouse weekend this year at the Oswego Lighthouse. It should be a great event as the lighthouse has been closed to the public and we will be operating from the radio room there. There may be a chance that some groups of the public will be brought out to the lighthouse while we are operating. The event takes place August 20-21, 2016. The special event call sign is W2L. It is located at the Oswego Harbor West Pierhead Lighthouse on Lake Ontario in Oswego. On August 20th and 21st of 2016, I will once again be setting up a special event station at the Verona Beach lighthouse on 4th Avenue in Sylvan Beach. The event is annual for the 3rd weekend in August. I have set up the special event station at the Verona Beach light for the past 3 years. With the permit already secured and the Verona Beach Lighthouse Association on board, this may be the best one yet! This year we will be operating from inside the lighthouse! Past years we set up right next to the light and the VBLA opened the light so people could look in. We have contacted 104 different lighthouses and lightships around the world during this event! Over 500 lighthouses and lightships have “Ham” stations set up for this weekend! Last year NYS Senator Griffo stopped by and “worked the rig” for a bit. He even made contact with the Cape May lighthouse in New Jersey. More information can be found at ILLW.net. Thank you for the interest and hope to work many of you over the weekend. Doug, W2GT is organizing an informal get-together Saturday, July 9th at Frontenac Park in Union Springs. The plan is to start in the early morning (~9am) set up a portable HF station and have some fun with other hams until probably mid-afternoon, depending on weather and band conditions, feel free to stop in. Doug and his group are regulars on the Bristol repeater (145.110, pl 110.9) and will be listening there. Frontenac Park is on the NE corner of Cayuga Lake - take State Route 90 into Union Springs and turn onto Chapel Street to the park, the pavilion is in an isolated area at the south end of the park . Its only 15 minutes from Auburn and less than hour from many areas in Oswego, Ithaca, Syracuse and Rochester. Come on out, meet some nice folks and enjoy some Ham radio outdoors! W2GT; Doug Bower can be reached at dbower58@gmail.com. With Oswego County RACES, operating from Fort Ontario in Oswego, NY. William Park, 7033 Lakeshore Road, Cicero, southern shore of Oneida Lake. 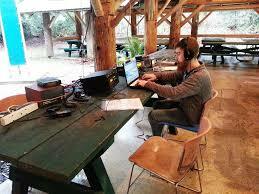 Class 4A with SSB, CW, and Digital modes plus a dedicated 6M station. Setup begins ~8am on Saturday, food service begins at noon on Saturday.